Hepatobiliary surgeon and head of surgery, Institut Bordet. There are 2 types of hepatic cancer: primary liver cancer and hepatic metastases originating from other primary tumours. Surgery is the major treatment for these cancers but it is limited by the need to conserve sufficient functional liver tissue. Other therapies may be combined with surgery. Medical imaging examinations (CT scan, MRI and PET scan) aim to locate hepatic tumours accurately and establish the surgical strategy to follow. The “resectability” of the tumour has to be confirmed. Can the tumour be completely removed while conserving sufficient functional liver tissue? This is the challenge in achieving a curative treatment! The patient also undergoes other examinations and tests (blood analysis, cardiac and respiratory assessment, etc) to evaluate his general state of health. Hepatic tumour resection is at the centre of the therapeutic strategy for liver cancer. It is often combined with other treatments, before or after surgery. The Institut Bordet Liver Tumour Multidisciplinary Cancer Care Team (CMO) meets every week and includes surgeons, gastroenterologists, medical oncologists, radiologists, nuclear medicine specialists, pathologists, a cancer psychologist and a cancer care nurse coordinator (ICSO). The purpose is to discuss each patient’s situation in a collaborative way. radiofrequency uses radio waves introduced into the tumour to “burn” the cancer cells through high frequency ultrasound. At the Institut Bordet, a combination of several treatments and surgical techniques is always considered. These complex, multidisciplinary approaches aim to improve results and the rate of cure. They enable radical surgical procedures to be carried out in patients with advanced stage hepatic cancer and can make it possible to operate on patients who were originally inoperable because of the number of hepatic lesions, their size or their location. In some cases, curative surgery is made possible by combining several pre-operative treatments and/or techniques such as chemotherapy, radioembolisation and portal vein embolization techniques which induce atrophy (reduction) of the part of the liver to be resected and hypertrophy of the residual part to compensate for functional deficit, etc. 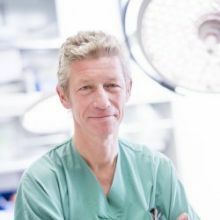 According to Dr Donckier, a hepatobiliary surgeon, advances in the years to come could lead to a better understanding of the biology of each tumour and the individual characteristics of patients. These two factors condition response to the different treatments and therefore, prognosis.